VIDEO OF THE BEGINNING: http://www.youtube.com/watch?v=Xxy30U2fPSE A game that I made out of inspiration of IWBTG. (It's in 8bit as a sort of tribute to it, along with teh gun.) The game has four paths, EZ, Med, Hard, and Insane. If you beat the insane path you still have to go through one of the other three to beat the game. Get all three keys to get the bonus boss! :D! 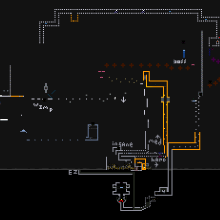 (Keys are found on: Yellow - Insane Path Blue - Hard Path Green - Any path will eventually get you there.) Definitely my hardest game yet, I'll get a playthrough of the beginning. Tell me where you die (along with a picture) and I'll make a checkpoint game for you if it's passed the heat blocks. There's also a blast gun and cookies hidden in the game. :3 And btw, no saying this is too hard, for that is the point.